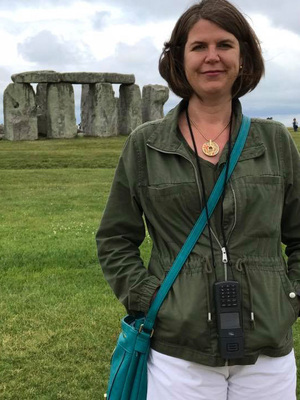 I am thrilled to welcome to my blog Dr. Sara M. Butler, the King George III Professor of British History at Ohio State University, author of Forensic Medicine and Death Investigation in Medieval England. After using up several packets of book darts marking passages in her book, I approached her about an interview. Not only did she accept, but, as you will see, she answers my questions with such depth and breadth that I feel you will get a far better sense of the book from her responses than any summary I might write. Suffice it to say that existing studies regarding the discovery and investigation of suspicious death left me with more questions than answers about: coroners–who they were, their status, the makeup and purpose of their juries; investigators–who investigated, were medical experts involved, and what was considered sufficient evidence; and what constituted guilt as we think of it. Sara’s book answers all my questions–what a gift! She writes with the clarity of one who has honed her understanding by presenting the material to her classes and making note of what confused them. A remarkable book, and a joy to read. Thank you, Sara. Q. What drew you to this topic? Was it something that came up while researching another project? Something you’d been curious about for a long while? A. I have always enjoyed a good murder mystery. As a child I read every Nancy Drew, Hardy Boys, and Trixie Belden mystery in publication, and harassed my two brothers to no end with my Hardy Boys’ fingerprinting kit that somehow always resulted with me turning one of them in to my parents as the culprit. As I grew older, I left the Hardy Boys behind, but still loved solving crimes. I toyed with the idea of pursuing a law degree, as many of my friends did, but I was less interested in working with people than mysteries. I had also fallen deeply in love with the Middle Ages and come to realize that historians are detectives in their right. They work with clues, piecing together a distant past that seems both familiar and oh-so-foreign at the same time. This book also evolved out of a great appreciation for the coroners’ rolls, with which I first became acquainted during my doctorate at Dalhousie University (Halifax, NS). I was working on the subject of marital violence, a thesis that eventually resulted in The Language of Abuse: Marital Violence in Later Medieval England (Brill 2007). For this project, I read mostly legal records because the law is one of the few ways that real people (the peasantry, the middle class) left an imprint on the medieval record. I spent months looking over trial records from medieval England, which are generally brief and formulaic; for the most part, the records give so few details the best you can do is count them. This is not true of coroners’ rolls, however. Many coroners (or their scribes) were intent to record every juicy detail, especially when it came to domestic spats! Wives caught with their lovers in flagrante; husbands eager to explain away their abuse as “discipline”; neighbors bursting into homes in the middle of the night to restore the peace before an argument spiraled out of control – the coroners’ rolls help to bring the history so tediously documented in the trial records to life. The one aspect that intrigued me most in this process was the coroner’s inquest jury, that group of men drawn from the visne (the region where the crime took place) to conduct an investigation into the events leading up to the sudden and unnatural death (coroners did not only investigate homicides, they also looked into accidental deaths and anything that seemed unnatural). Reading Thomas Green’s work (Verdict according to Conscience: Perspectives on the English Criminal Trial Jury, 1200-1800) helped me to understand why their verdicts were sometimes at odds with those of juries later on in the process: Green emphasizes that juries represent communal, rather than crown, values. This made me realize that juries had their own personalities and their own baggage, and by exploring their verdicts I might crack a window onto the lives of these captivating communities. All of my early work is focused on the jury and its impact on the judicial system and people’s lives, whether in cases of marital violence, abortion, suicide, or infanticide. Q. You correct several concepts about the medieval coroner as well as coroners’ juries and investigating the crime scene. My impression is that most of the errors arose because scholars had too narrow a scope. How did this catch your attention? 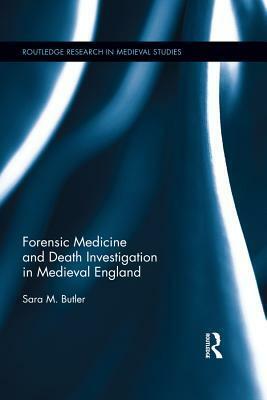 The central thrust of my book is that England was not, in fact, centuries behind the Continent when it comes to the use of forensic medicine, but rather the nature of the records hide the participation of the medical profession in death investigations. England is often “othered” by Continental historians who just don’t understand the vocabulary of English law and who get irritated by the fact that greedy England hogs the spotlight, but also by English historians who choose to believe that England was unique, always dancing to the beat of its own drum. However, the channel was not much of a barrier keeping knowledge out. The English were well aware of how law was practiced on the Continent: remember that many of the king’s justices and sheriffs during the thirteenth century were university-trained clerics who studied in Paris or Bologna. They were not out of touch with Continental trends in jurisprudence or law enforcement. The problem is borne from the records themselves. The purpose of English records of crown pleas (i.e. records concerning felonies) was financial: the king wanted what was owed to him to be closely recorded. The king was less interested in the details of the case or the methods of investigation. Accordingly, there was no need for a coroner to explain in writing that of course he had sought out a barber-surgeon to sit on the jury so that a proper examination of the corpse might ensue. I spent a lot of time in this book trying to resurrect the reputation of the medieval English criminal process. Our capitalist mindset today makes it hard for us to understand that people in the English past regularly took on jobs that were unpaid and that did not deter them from working hard. We have a tendency to believe that you get what you paid for: thus, if coroners were unpaid, surely little could have been expected of them. The medieval records simply do not uphold this perspective. Yes, some coroners were lazy; but many others worked hard, showed up in a timely fashion, and were determined to do their best. Q. Research is a process, never truly complete. Has anything come up in further research that you wish you’d been able to include in this book? A. Not yet! But give me time. Q. Were there any stories you wish you could have included? Would you care to share some here? Q. I came away from the book with a new respect for the medieval coroner and the jury process. I also have a new appreciation for the differences between now and then in the purpose of juries and the goals of an investigation/trial, as well as what is considered the important truth in the cases. Is there any particular instance of this that stands out in your mind? Did it change how you think about crime and punishment? A. I read Richard Firth Green’s A Crisis of Truth: Literature and Law in Ricardian England (U of Pennsylvania P, 1999) back in the days of my doctorate and it was an eye-opening experience for me. Firth Green was the first to explain clearly that what we see as “truth” is not really the same as what a medieval jury understood as truth. When a trial jury took an oath to speak the truth, they did not mean about the events leading up to a crime and whether the defendant was in fact the perpetrator; they meant the truth about the man’s character. If they acquitted him, would he repent of his sins? Or, would he fall back into a life of crime? Could he be reintegrated into the community in a way that might restore peace and harmony? The most important mental shift that is required to understand the medieval courts is that, despite what we see on television, they were not bloodthirsty. Hangings were fairly rare in the medieval period, and no one was eager to see a member of their community dangling from a rope. Most defendants were acquitted, not because their system of law enforcement was inefficient, but because it was a Christian society and they believed in giving people second chances. My favorite case will always be the death of Roger son of Gervase, drawn from the miracle stories of St Thomas de Cantilupe, Bishop of Hereford. Roger was two years old and naked when he wandered out of his house in the middle of the night while his mother and father were at an all-night vigil praying for the souls of two recently deceased fellow villagers. Drawn naturally across the bridge leading to the castle where his father worked as a cook, the boy fell from the dark and icy bridge, smashing his infant body on the rocks below, and eventually freezing to death. The boy’s body was found the following morning. The coroners appeared immediately and began to conduct their investigation. Despite being prohibited from entering the scene of the accident while the coroners’ and their jury were embroiled in the minutiae of the investigation, one burgher climbed down to the child and bent a penny to Saint Thomas, promising to visit him at his tomb if he brought the child back to life. Lo and behold, Thomas heard his prayers and the boy began to move his right arm ever so tentatively. The burgher alerted the coroners and carried the frozen boy to his mother, who was half out of her mind with grief, and she warmed his naked body against her flesh. That night the entire village, including the coroners, celebrated with a procession to the church, singing Te Deum Laudamus. This miracle story gives us an opportunity to see the coroners as human beings. Far too often studies focus on the corruption of medieval law enforcement: coroners who refused to hold inquests unless paid to do so, who misappropriated funds, or who failed to investigate a sudden death because the weather was too cold and unpleasant for traveling. This story, however, shows us coroners who were delighted to find that their trip had been unnecessary after all, who shared in a community’s joy that one of their own had risen. Q. As a novelist writing about crime in medieval England I appreciate your explanations of the differences between how we view crime and punishment, but also in what is expected of the various professions/officials involved. For instance, you mention that coroners’ juries were better served by barbers and surgeons than by physicians because the latter were trained to be theorists rather than hands-on practitioners. They hired surgeons or barbers for hands-on medical care. In your other research projects have you come across other examples of occupational tags that no longer mean what they did in the past? A. I’m delighted that you appreciate that aspect! One of my reviewers wanted all of that cut, but I stubbornly refused. That viewpoint was essential to my motivation for writing the book. I also felt that it was useful tool to make sense of what we were reading in the medieval record. In terms of occupations: Before doing the research for this book, I never understood King Edward III’s 1363/64 pronouncement of one craft per person (37 Edw. III, c. 6). Why would the king feel it necessary to limit men to only one trade? As I tried to figure out how to classify who might belong to the pool of medieval medical practitioners, I realized just why Edward III made this declaration. Occupational diversity was the norm in late medieval England. Hardly anyone worked in just one profession. A chandler needed wax to make candles: but wax could also be used for other purposes, such as shaping pills and making ointments. Why not expand also into the apothecary profession? Similarly, overlap existed between surgeons and metalworkers: a surgeon needed iron-tools for his work, and metalworker produced those tools. Why not have one man employed in both trades? Because of this it was not all that easy to pigeonhole men and women from the era. To the king, this was frustrating because he saw the guilds as a useful way to control the population and he wanted everyone to fit neatly into a category. To me this is really exciting because it suggests much more ambition, creativity, and flexibility than we often imagine of medieval men and women. Q. In writing about medieval England for a popular audience I am keenly aware of the trap set by a common language—I do glossaries for my readers, but quite often my editors urge me to avoid the words that might confuse them. Most hilariously, an editor asked me why there were bars at all the gates of York—took me a day to realize that she thought Monk Bar was a tavern. But I have gone down a rabbit hole in doing research when I didn’t realize I was chasing the wrong term. Has this ever tripped you up? How do you flag these items in your own research? A. Language is a serious problem for me. I write about legal history; however, I am determined to write for a wider audience than the few legal historians that I see regularly at the Conference for British Legal History. However, when I try to write in a more accessible manner by sidestepping the legal jargon, reviewers of my work in the field of legal history seem to think I’m avoiding it because I don’t know it. I have been told by the editors of legal history journals that I write social history, not legal history, while the editors of social history journals have insisted quite the opposite. Sigh. In this book, I have tried my best to include all the legal jargon, but to explain it to my audience in the hopes that this might be a useful handbook of sorts for tackling other works of medieval legal history. The legal record is too useful to social historians to be ignored, but it is a shame that so much of the legal history out there sounds as if it was written by a lawyer. My students play a key role for me in determining which terms need to be explained so that I avoid your Monk Bar experience! Students have told me that they thought “gaol” was a high class prison (why else would it be spelled so oddly? ); that an “eyre” (itinerant court) was a lovely, lilting tune; that justices of the peace were only interested in marrying people; and that a villein (an unfree tenant) was in fact always the bad guy. Q. Often when I’m writing one book I find something that I tuck away for another book. Did writing Forensic Medicine lead to a future project for you? A. It led me to two new projects. One: I’m working on an article about juries of matrons, the women who were called in to perform a physical examination of convicted felons who claimed to be pregnant, and another one on pleas of the belly. Medieval courts did not execute pregnant mothers: they waited until after the birth of the child before they executed its mother. I’m interested in knowing more about the matrons: who were they? How did they qualify as matrons, that is, were they mothers, or medical practitioners? How did they decide whether a woman had in fact conceived? I’m also interested in pregnant felons and their treatment in prison. Did they actually give birth in prisons, and what happened to the babies? How long after the birth were they executed? Two: I’m working on a new book project on peine forte et dure. When a defendant refused to plead to a felony indictment, the English courts were left in a quandary. In the English system, defendants had to consent to be tried: consent came in the form of a plea. If the defendant refused to plead, what is better known as “standing mute,” then he could not be tried. 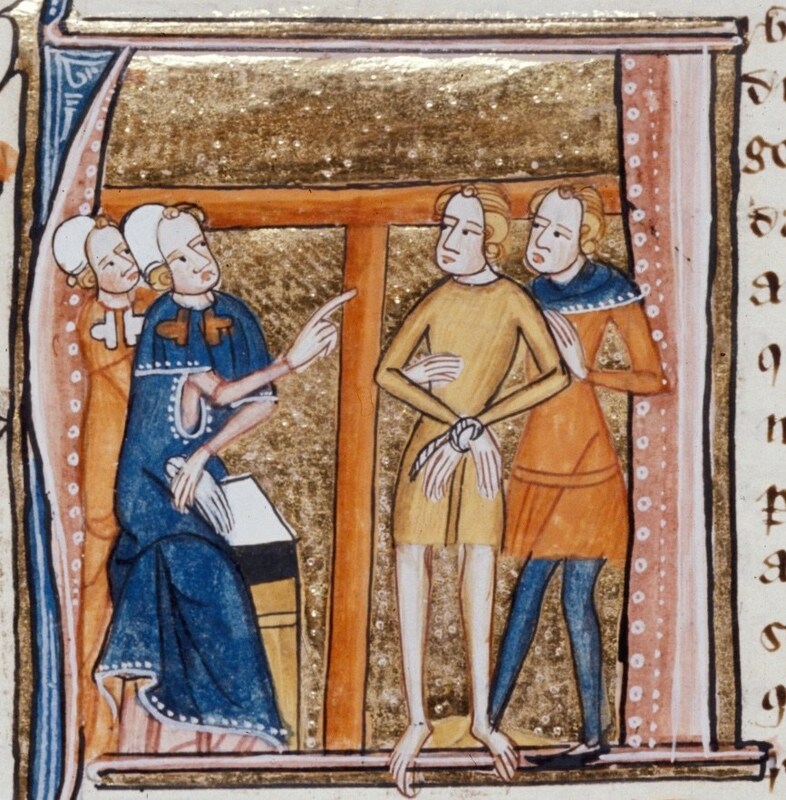 Accordingly, the king’s justices sent him back to prison to be coerced into pleading. He was subjected to peine forte et dure: strong and hard punishment, essentially pressing with weights and a starvation diet, until he agreed to undergo jury trial. By the early modern period, this had come to be death sentence, and is probably best known to a non-legal historian audience by the deaths of Saint Margaret of Clitherow (a recusant during Queen Elizabeth’s reign), or Giles Corey (during the Salem Witch trials). During my research I came across a number of deaths from peine forte et dure and it made me question why anyone would choose to undergo the peine. I also wondered why the English employed the peine: the English were always proud of the fact that they did not employ judicial torture. Yet, peine forte et dure sounds an awful lot like it. My book is going to look at how the practice evolved, and how the peine fit in with the ideology behind justice in the medieval English context. A most enlightening interview. Thank you, Candace and Dr. Butler, for such a thorough exposition about the genesis and central matter of this book. My copy of the book arrived late yesterday!